Today, I come to you with a very special review and it’s LIVE all the way from the Zuri White Sands and Resort in Varca, Goa! Yes, you heard that right. Along with 50 other bloggers, I was flown here by Blog Adda and Tata Motors, to be a part of an exclusive two-day Live Blogging and driving experience. If you want to read all about the Goan experience, that’s up for your viewing here! Go check it out for some cool photos! 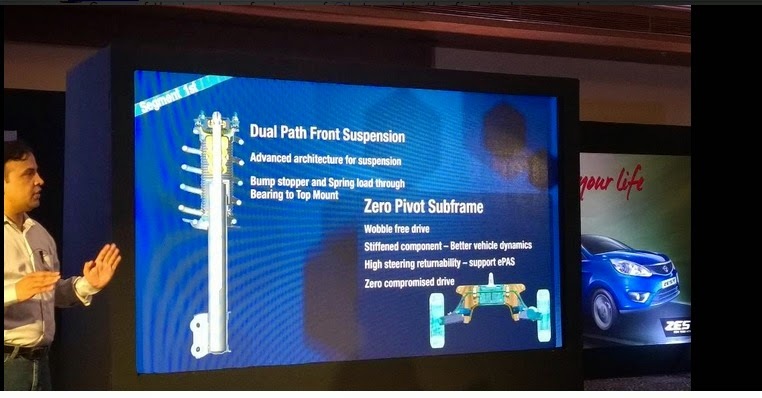 On Saturday evening, we had a detailed presentation by the team from Tata Motors who walked us through the entire engineering and design experience behind the Tata Zest. We had Minari Shah from Tata Motors talking about the four-pronged approach of the Zest team: Design Next, Drive Next, Connect Next and Horizon Next. This was followed by the engineering team who did a wonderful job of outlining what goes into the making of a car such as this one. The fact that 250 engineers spent three years making this car what it is today was a jaw-dropping revelation. 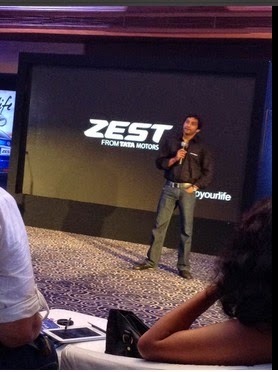 The cream on the cake, so to speak, was the surprise guest appearance of India’s superstar racer, Narain Karthikeyan, who regaled the bloggers with his views on the car and the fluidic experience of speed that he is so used to. That surely made all of us sit up and piqued the interest in the car to a new level. Sunday morning began with a quick rundown of the things we would need to do before we set out on our drives. The bloggers were split into groups of three and assigned a petrol as well as a diesel variant to drive for a 26-km stretch. I was paired up with Shilpa Garg who blogs at A rose is a rose is a rose and Pranay Nigotiya who blogs at Pranay Nigotiya.com and we began the quest with the manual Petrol variant of the Tata Zest. This was followed by the AMT Diesel version. This refers to the very stylish and sleek console of the car in the front panel which houses the Infotainment system, sporting a touch screen and some pretty cool add-on features that we were happy to try out when we set out on our test drive across the verdant and winding roads of Goa. Chief among them was the Bluetooth connectivity and the Voice Command Recognition (VCR) feature. The Bluetooth in the car can connect to two devices simultaneously inside the car and allows users to answer/ make phone calls in hands-free mode. The VCR feature is particularly good since it detects Indian accents effectively and had zero- error functioning on our 2-hour long drive. The switching of gears happened pretty seamlessly and the car responded pretty well to the pickup, especially on long, straight stretches where we could really test the limits of the speed. The fact that it was an AMT (Automatic Transmission) was very intriguing, since this will be the first-ever Diesel AMT in this class in India. The pickup was much better when compared to the petrol variant, probably due to the fact that the gear switching happens on auto mode. The wheel size is comfortable and designed in a very innovative way, keeping the needs of the driver in mind. Power steering is effortless and the car handles very well on winding roads. The leg room in both the front and back seats is not just sufficient but roomy. Pranay, who is 6 feet tall, admitted that the leg room at the back was sufficient enough for him in the rear seat. So, that’s a definite win in my book! As a family who drives everywhere for recreational purposes, this was a wonderful thing to do for me. In 2012, my family and I drove all the way to Goa from Bangalore, in a Tata Indigo. The car performed spectacularly under the onslaught of the Indian roads and weather conditions. This is no mean feat and one that I have always admired about any TATA car. I do wish that the boot space in the car could have been a little more, but for a small family, it wouldn’t be a very big constraint. The other thing which I would have appreciated was the availability of bottle holders in the side pockets of the front seats. There were a couple of cup holders in the gear box area, but these would not be sufficient for long drives. During the drive organised by Tata Motors, I got to chatting with fellow bloggers +Shilpa Garg and +Pranay Nigotiya. It was such fun to exchange notes on blogging, our interests, how our lives revolve around our blogs and the fact that we were really enjoying the weekend at Varca, Goa. 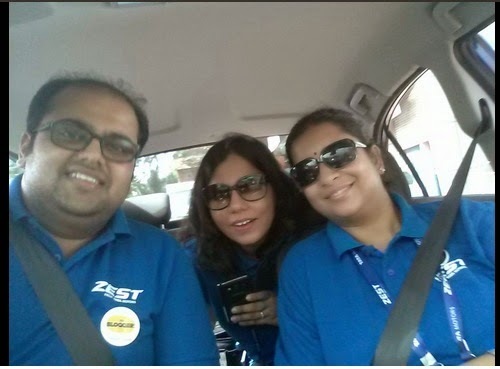 Hey, we even got time to click a blogger ‘selfie’ as part of the drive! 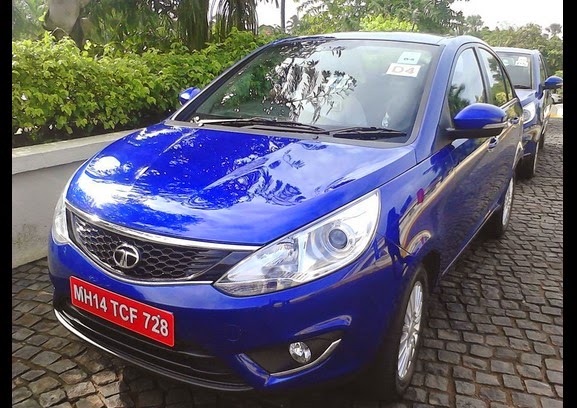 Overall, the TATA Zest experience was a very satisfying one. The Tata team as well as the Blog Adda team were very proactive when it came to organising this event. They had volunteers standing with large sign boards at each point/ turnoff to guide the bloggers across their journey. In addition, each car had a volunteer from Tata Motors who patiently explained any queries we may have had about the car or the driving experience. Nice review! Great to hear you're having a fun weekend :). Fab review, Shailaja. I'm so glad you all had a great experience! So much fun that I am still basking in the afterglow 🙂 Thanks for reading, Aparna! It is a very good car indeed! I was rushed for time, so managed to add a picture of the car last night. Thanks for reading, Vinodini! Thanks Vidya. Yours was such a treat to read! Sounds like a cool car. You sure had a blast.